At 4:30AM the alarm clock went off and instead of my usual slap at the snooze bar I happily jumped from bed and started the day. After getting cleaned up and dressed I hopped in my car and drove to the airport in order to make my 6:46AM flight to New York’s LaGuardia airport. Fortunately, my plane took off on time and by 8:00AM I was safely on the ground in my destination. After getting my clubs from baggage claim, a short shuttle ride to the car rental desk and a little standing in line I pulled out of the Hertz parking lot and began following my GPS unit’s directions to take me to Garden City, New York. Today I’ll be playing at Garden City Golf Club. As usual when it comes to the New York courses on the list, my college buddy Jay was instrumental in helping me. A couple of years ago I met Bill, a work associate of Jay’s, who invited the the two of us to play with him at Bayonne Golf Club. Earlier this year during a lunch between Jay, Bill and another colleague named David my Top 100 Quest came up. It turned out that David has a good friend at Garden City Golf Club and before I could even really understand what was happening he had arranged for Bill, himself and me to make a visit to Garden City with his friend. If only it was always that smooth! Garden City is just a little over 20 miles from LaGuardia, but the route is mostly through business and residential areas so it was a good 35-40 minutes before I pulled into town. Once I arrived I sent an email to David to let him know I had arrived and that I would be right on time for our scheduled meeting. Since I was a little early I decided to tool around Garden City which I must say is quite the charming little community. After about 20 minutes I headed over to the club to meet the rest of the guys. Once I pulled up to the club and parked I did something that I’ve never done before at any other golf club I’ve visited. I stepped out of my car and put on my blue blazer. Upon arrival at Garden City Golf Club all members and guests must be wearing a jacket and leather shoes. Having a jacket rule for entrance to the clubhouse during evening hours is not uncommon, but I’m not aware of any other club in the U.S. where it is a requirement all day long. Since I would be wearing a jacket I also wore long pants to complete the ensemble and brought my golf shorts in a bag so I could change in the locker room. I found it rather humorous how easy it was to tell the difference between the members and the guests. The guests seemed to have all arrived like me, wearing slacks to go with their jackets. The members, on the other hand, were clearly more comfortable with this unique piece of club culture and were walking around in their jackets with short pants and loafers. I loved it! Garden City Golf Club was founded in 1899 and throughout its 111 year history has always been a golf club exclusively for men. 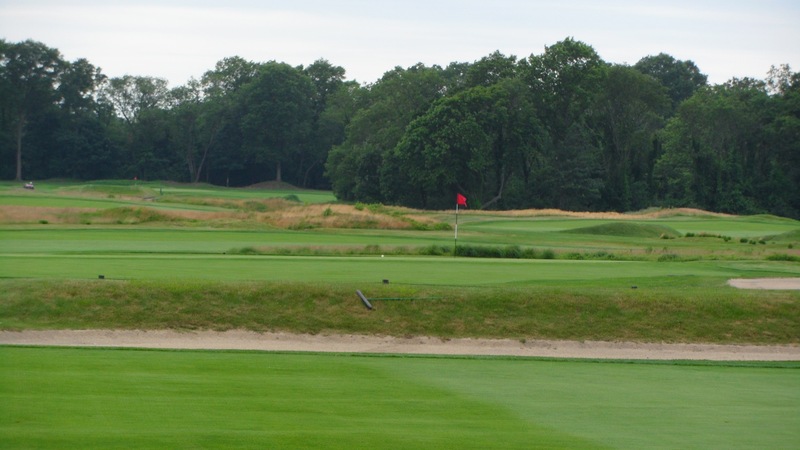 The course was originally designed by Devereux Emmet, and then redesigned in the 1900s by the great amateur golfer Walter Travis. 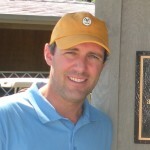 Travis was a founding member of Garden City Golf Club and in addition to having a hand in the design of the course he is very much a large part of the club’s history. There is a wonderful biography about this great golfer entitled The Old Man. If you are interested you can pick up a copy here. 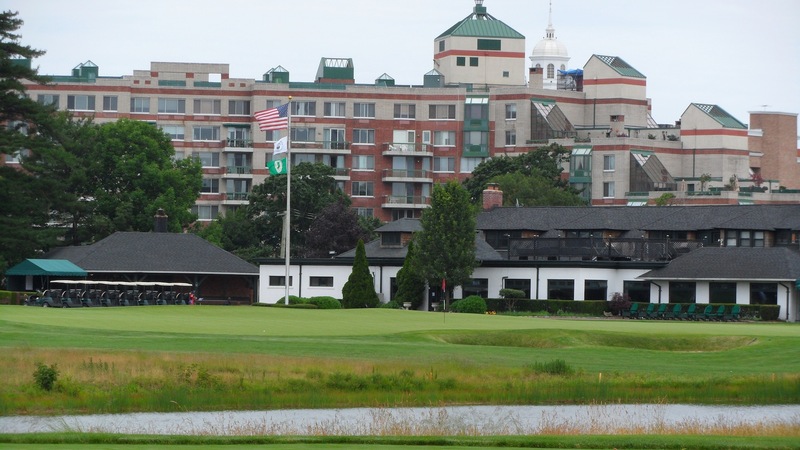 As you would expect of a club established in the 19th century, Garden City Golf Club has a rich tournament history having been host to six events put on by the U.S.G.A. 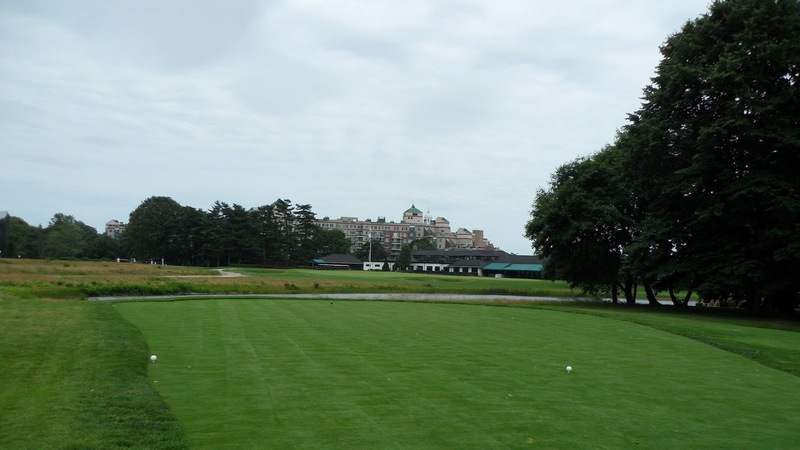 There was the 1902 U.S. Open, the U.S. Amateur in 1900, 1908, 1913 and 1936 and finally the Walker Cup in 1924. 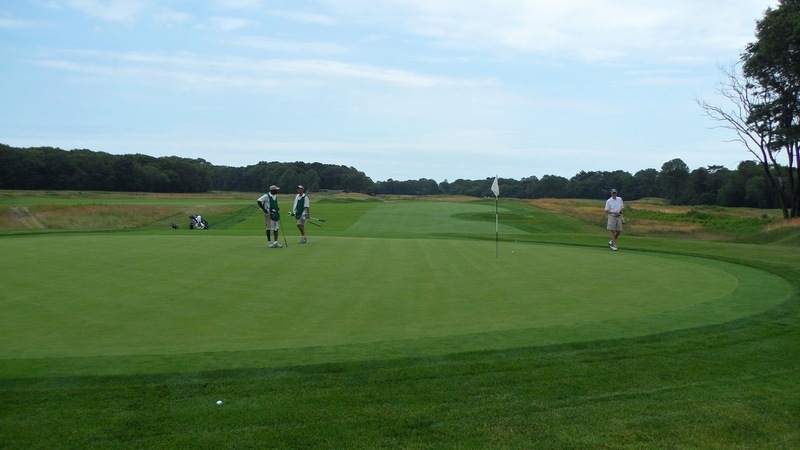 These days the only event held at Garden City Golf Club is the Travis Invitational which is one of the premier Mid-Amateur events in the U.S. Walking through the front door of Garden City Golf Club is like walking into a time warp. All morning long my actions had been dominated by technology. There were alarm clocks, automobiles, airplanes, cell phones, email and GPS units. 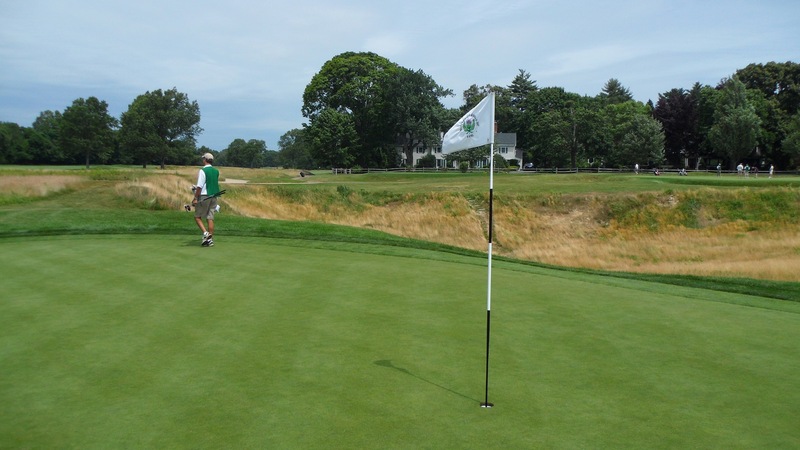 Once you enter Garden City Golf Club it feels as if you have stumbled into a spot frozen in time and even using the word email just feels out of place. The locker room is filled with wonderful old open grate metal lockers and around every corner the walls are loaded with memorabilia from the hickory golf era. One quirky detail that I found interesting is the very old urinals in the bathroom. Yes you read that right, I’m about to comment on the urinals. As a person who is into restoring old houses I’ve spent some time in salvage yards picking through antique plumbing fixtures and I’d be willing to bet that those fixtures were at least 75-80 years old and quite possibly older. Unbelievably cool! Garden City Golf Club is a throw back in the absolute best sense of the word. In a society where flashy and new are the norm, hats are worn indoors and men’s dress has grown inconceivably casual; Garden City Golf Club still holds fast to the traditions and ideals of another time. I applaud this. Once inside, David introduced me to our host who gave a quick tour of the locker room and clubhouse before taking us to the practice tee for a few warm up swings. We were just waiting on Bill to arrive, but it seems the driver who was bringing him out from the city was having a bit of a problem finding the club. The driver made the very common mistake of going to the Garden City Country Club which is right down the road. Because this happens quite a bit the staff at GCCC is always ready to redirect the lost souls a mile or so down the road to the correct spot. Once Bill arrived and took a few practice swings our four ball was complete and we headed to the first tee. We elected for the Championship tees which play to a par of 73 and a yardage of 6,911. 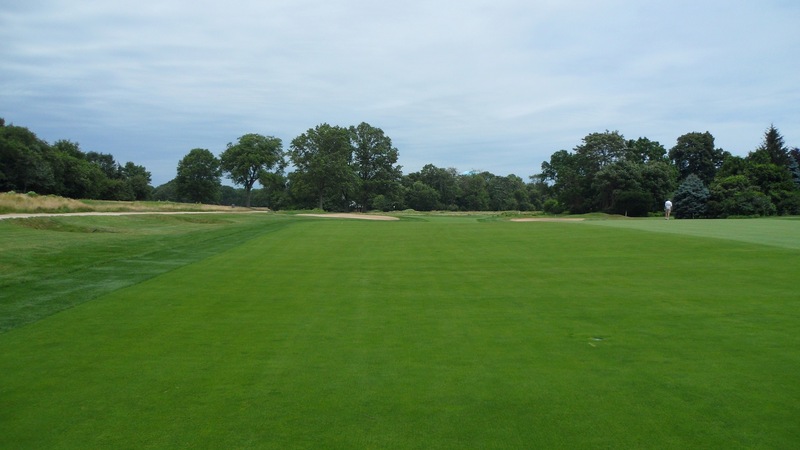 Although this is the longest tee option on the scorecard, players who want to stretch it all the way out can move back and play the plates which give just a little bit more added length. 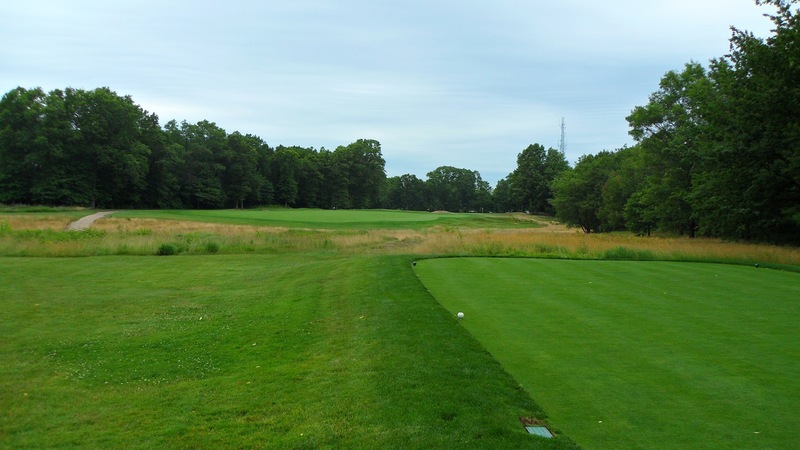 The photo below was taken on the first tee which is a friendly starting hole of a mere 302 yards with a par of 4. Bombing driver is an option, but I think the smarter play is a nice little 200 yard shot to the left side of the fairway. The fairway on the first hole is a split fairway of sorts. If hitting a shorter shot the line is to take it down the left hand side. You can see the ball lying there in the fairway in the photos below. If hitting driver its better to play to the right side of the hole and have you ball land in the other part of the fairway. David hit driver here and you can see him in the white shirt up around the green. That is near where his ball landed. The 2nd hole is a par 3 that plays 137 yards over a small valley. 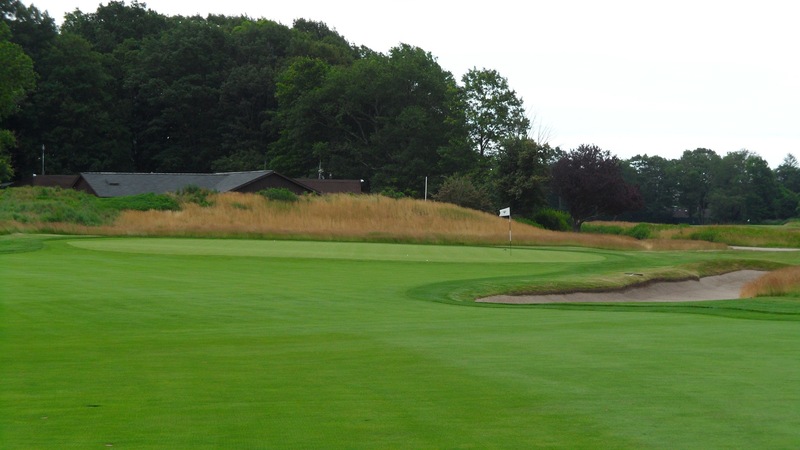 There are plenty of bunkers and long grass to cause problems for tee shots that come up short. 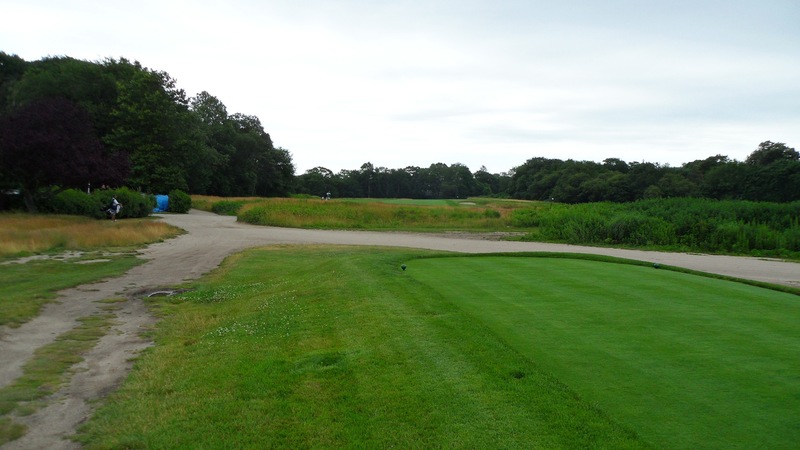 The photo below was taken from the green looking back towards the tee box. This is the only par 3 on the the first nine holes. The 3rd hole is a healthy par 4 playing at 407 yards. It’s a fairly straight forward hole, but there is bunker trouble lurking everywhere. 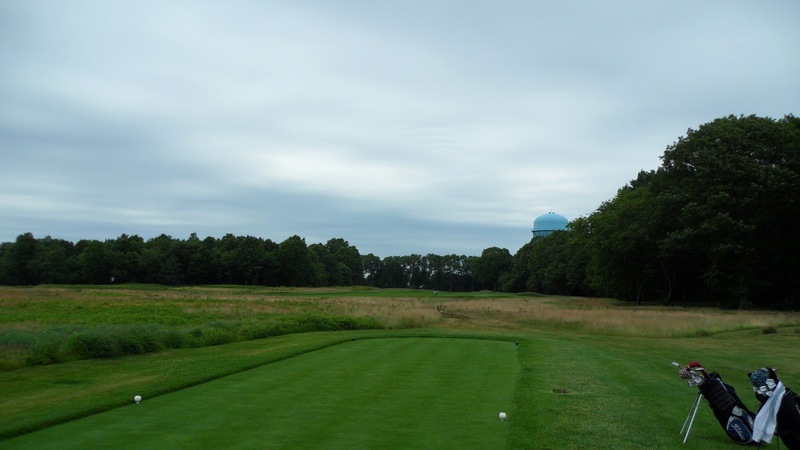 The photo below was taken from the fairway around where an approach shot would be made. To the left you can just barely make out the bunkers in the rough and up around the green there are a number of bunkers as well . . . one of which was my undoing. 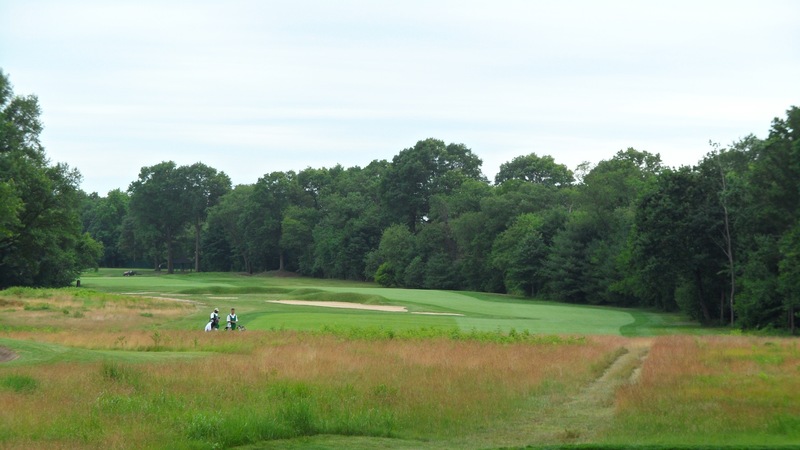 The 4th hole is where the course makes a turn to go “out in the field” as the members put it. This is also where we were informed that we could remove our shirts if we wished to do so. There are only three rules at Garden City Golf Club. 1. wear a jacket and leather shoes upon arrival 2. no cell phones/blackberries, etc. 3. no women. If you want to play golf John Daly style with no shirt, this is your place. I elected to play traditional style and left my shirt on. I’m sure everyone in the group was grateful for this. The 4th hole is a par 5 that plays 523 yards from the championship tees. The photo below was taken from the tee box. 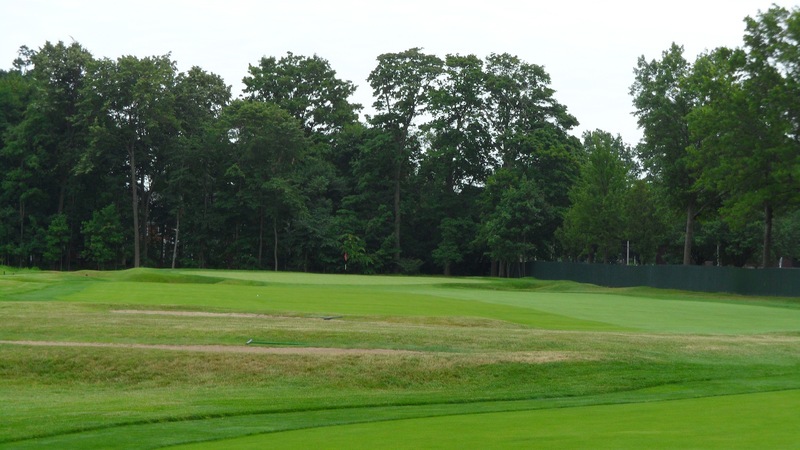 Below is a photo that was taken in the fairway from where a second shot would be played. Note the red and white checkered flag in the foreground. There are several of these around the course and are used to mark deep bunkers that are not visible to golfers on the tee. It’s a good thing they were there because the bunkers they marked were definitely not ones that you would want to visit. The 5th hole is a shortish par 4 that we played from 360 yards. The fairway seemed fairly narrow, so hitting a driver may not be the best play considering the length and tightness of the hole. 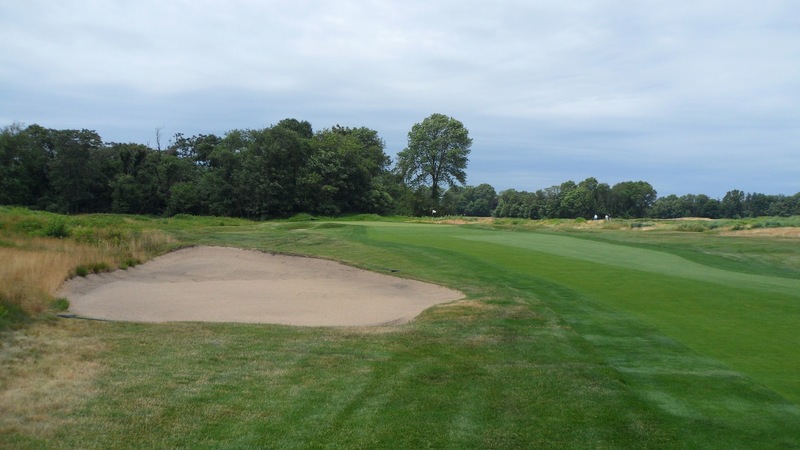 There are bunkers flanking the fairway that can pose a problem if you stray too far off track. 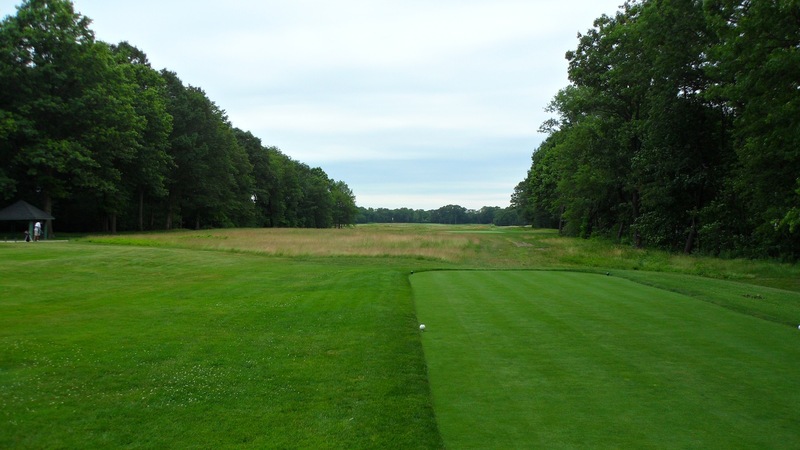 The photo below was taken around where an approach shot would be hit from after a pretty big drive. Here is a view of the 5th green from the 6th tee box. The 6th hole was LONG. This one is a par 4 that played 440 yards and is the #1 handicap hole. A good drive here is essential. The photo below was taken from the tee box. Here is a look back down the hole from behind the green. The 7th hole is a par 5 that we played from 550 yards. The photo below is the 7th green. 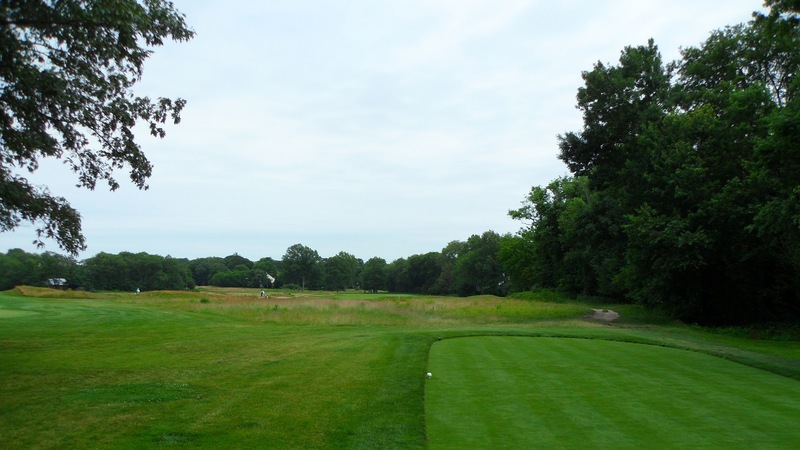 The 8th hole pictured below is another long par 4 that we played from 418 yards. The drive is pretty straight forward here . . . hit it down the middle. Its crucial to make a good approach shot on this hole as you don’t want to find yourself in the bunker across the front of the green. 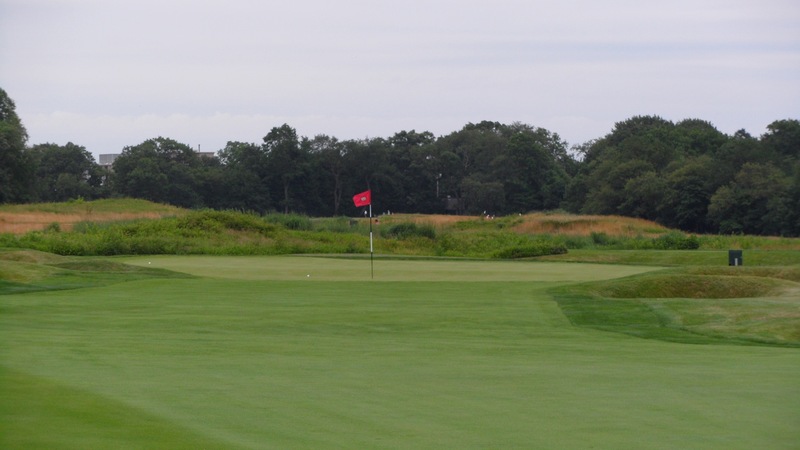 There is a good 15-20 yards just to get the ball onto the putting surface. If the flag is at the back like it is in the photo below it makes for a very difficult sand shot. Of course when the flag is at the back the approach shots that go long can find a little bit of trouble as well. 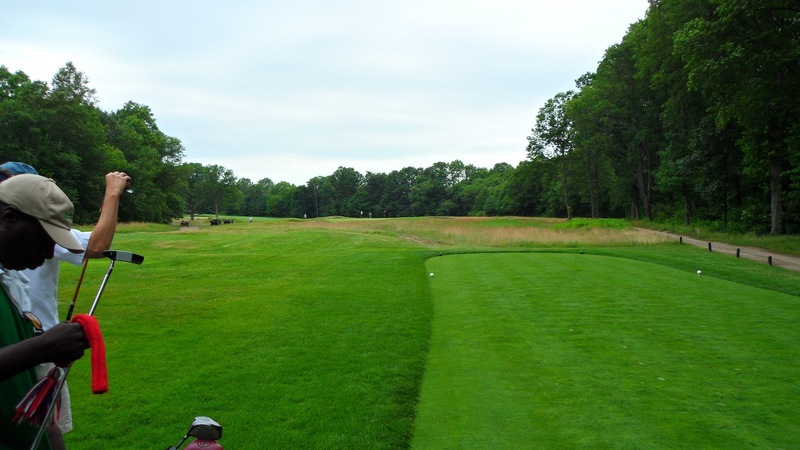 The photo below is where one of our players’ approach shot ended up. I should have taken a picture of his ball after he stiffed his sand shot to less than a foot. Short sided in a bunker and knocking it tight definitely wins the shot of the day award. The 9th hole is a short par 4 of 323 yards. The ideal drive here is out to the left. 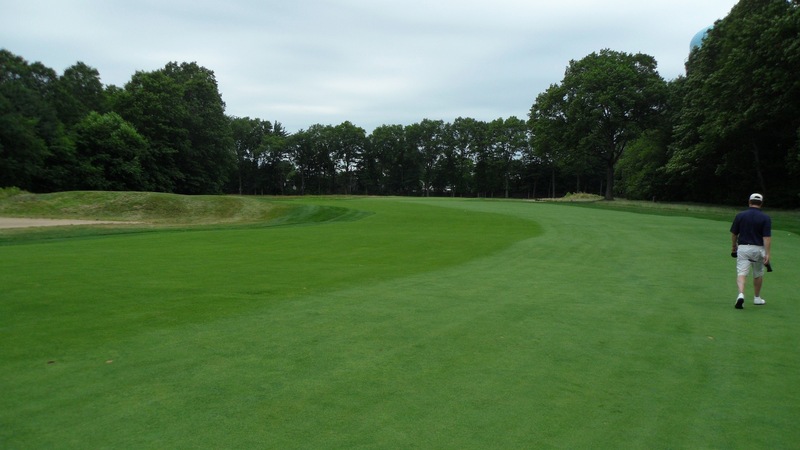 Drives that go right will find bunkers flanking that side of the fairway. A 200 yard shot for the drive will leave just a shot iron to the green. The photo below was taken from the tee box. Below is a photo of the approach shot which was roughly 120 yards for me. A a little closer look at the green. 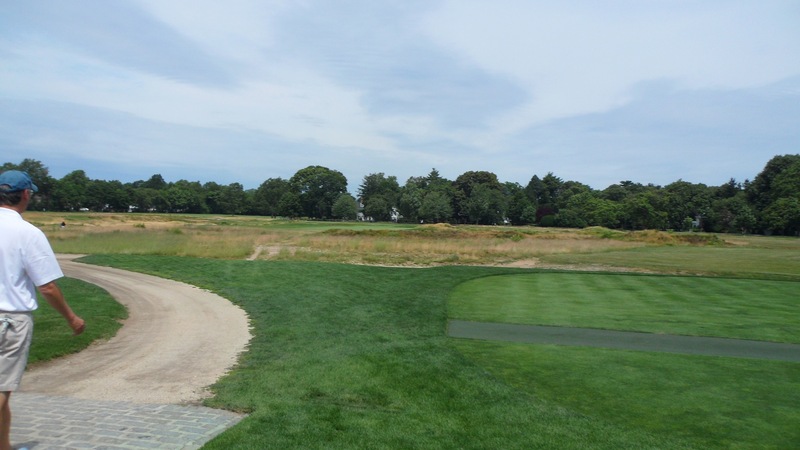 Its a bit tough to see in this photo, but there is a ridge alongside the back of the green that can wreak havoc on shots that go long and have to be played back towards the hole – especially when there is a back hole location. 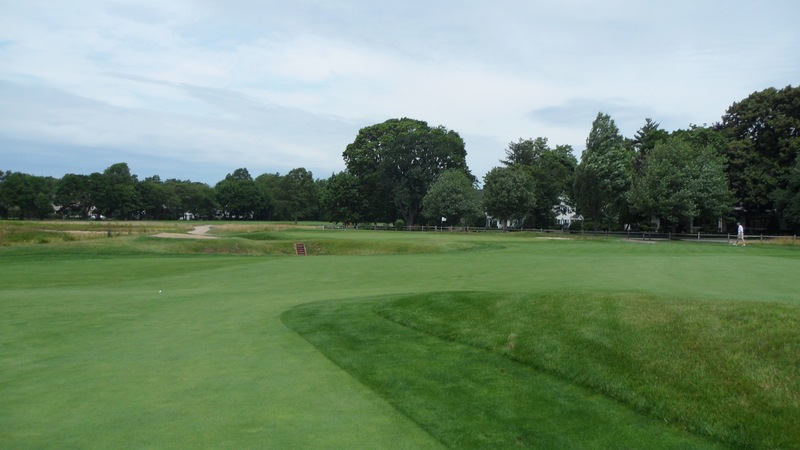 If you’ve read my comments on this site about other courses you will know that I have an affinity for courses where the routing does not bring the 9th hole back to the clubhouse, so I was pleased when we turned from 9 to 10 far, far away from the clubhouse. 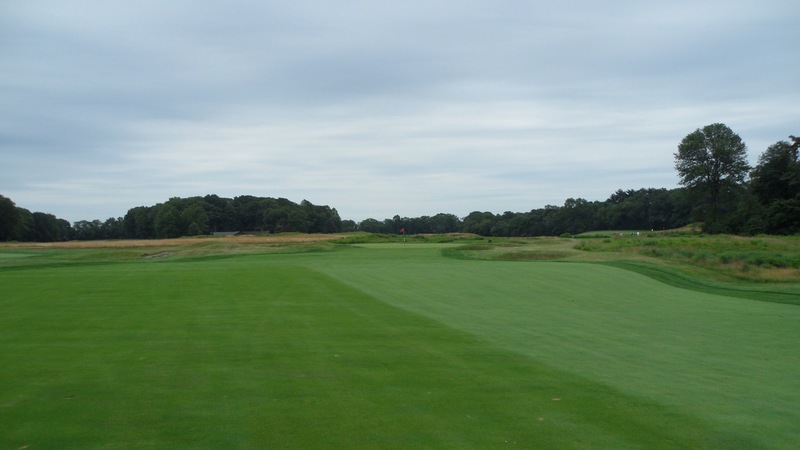 The 10th hole is another long par 4 at 414 yards where a good drive will help set up a scoring opportunity. The photo below was taken from the tee box. 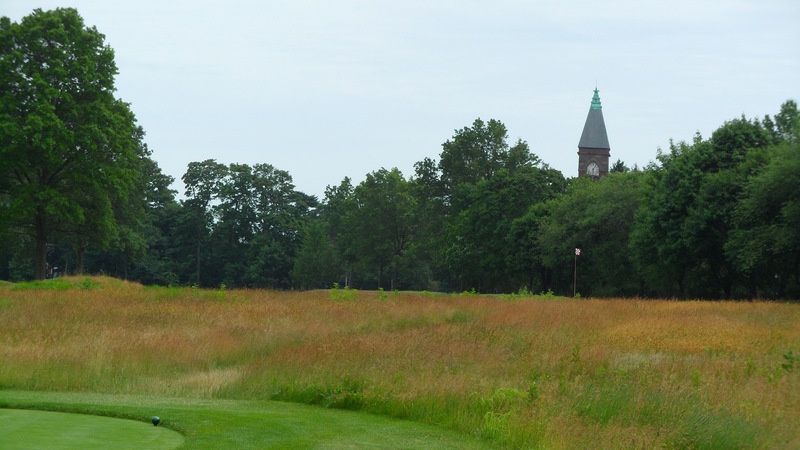 In case you haven’t noticed from the photos yet the terrain at Garden City Golf Club is mostly level and a lot of the tee shots require a carry over the long native grass. On this hole I decided I would check out the long grass up close and personal so I hit my drive straight into the ground about 60 yards off the tee. Nice. Fortunately I had a good lie in the grass. Although it is definitely penal, if you catch a little luck you can play a reasonably long shot out of the grass. 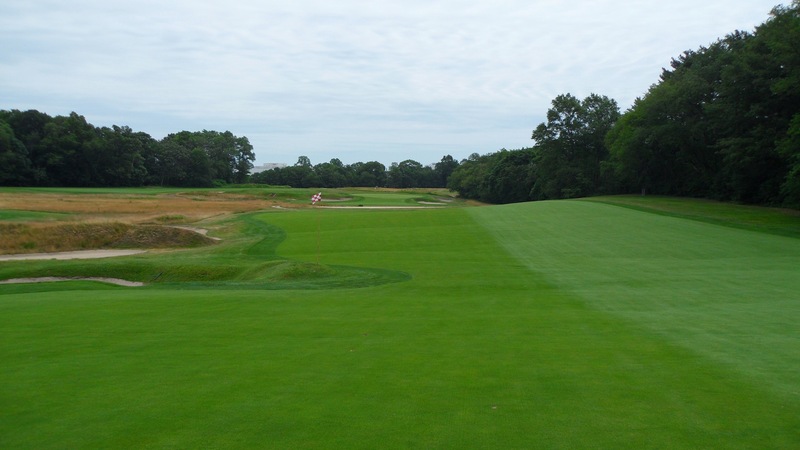 Its not like hitting out of thick U.S. Open rough were all you can use is a wedge. I managed to hit a nice shot out of the junk and was in position to get up and down for par. Below is a photo of the 10th green. I laid my second shot up short of the bunker and had a relatively short chip to the green from there. Not the ideal way to play the hole, but it worked. 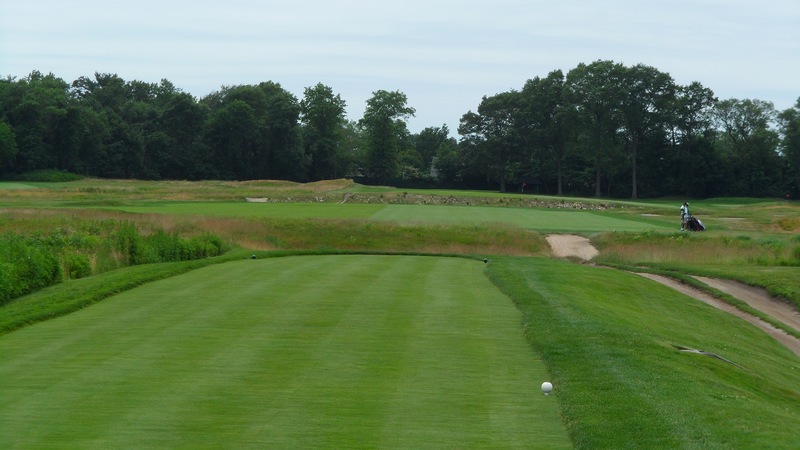 The 11th hole is a long par 4 of 426 yards. this one is a slight dogleg left as you approach the green. Driving the ball down the right side of the fairway sets up a better angle as you are coming into the green. 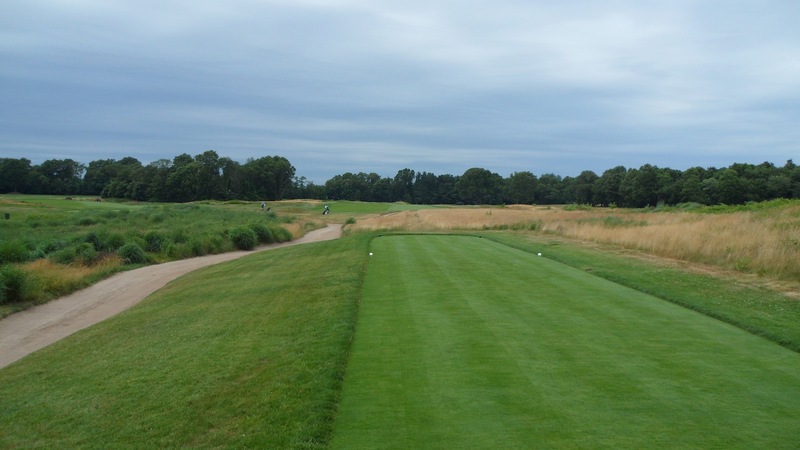 Below is a photo of the approach to the 11th hole. The 12th hole pictured below is a nice par 3 that we played from 193 yards. The wind was blowing in our faces here so a little extra club was a pretty good idea. As you can see in the photo below there is a bit of a false front to the green. Even with the extra club I did not have enough and my ball rolled down the false front and made for a long birdie putt. I loved the 13th hole which is a 538 yard par 5. the photo below was taken on the tee box and the line to take for shorter hitter (like me) is right at the bunker. During the Travis Invitational the players bomb it up the right hand side and beyond the bunker. It’s much more narrow over there and a risky shot. The reward it a chance to get home in two. If only I were that long and that accurate. The 14th hole is a short par 4 playing at 343 yards. 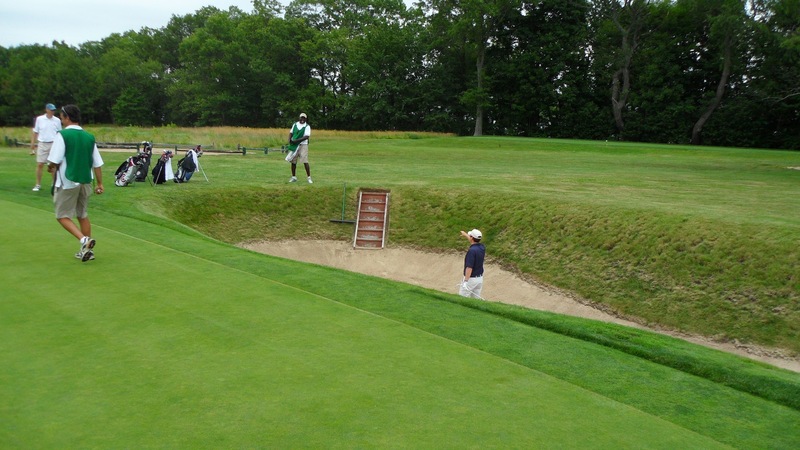 There are some nasty bunkers to be avoided on the approach shot which is pictured below. The green at the 14th had a tricky little dip to it from where my ball landed in relation to the hole. The flag was at the front of the green and I had less than a 6 footer for birdie, but was behind the hole and had to negotiate the break in order to find the cup. I misread it badly and had to settle for a par. The 15th hole, pictured below from the tee box, is the longest par 4 on the course at 447 yards and is a fantastic hole. The drive is fairly straight forward and really just needs to be hit as close to the middle as possible. The real fun here comes in the second shot which is typically a fairly long one based on the total yardage of the hole. Our host directed me to use the lighting shelter in the back of the green as my line and to land the ball just on the front of the green feeding it right and down to the hole. My execution was off just a hair and I was a couple of feet off the front of the green. Two strokes later I had a par so that was just fine by me. 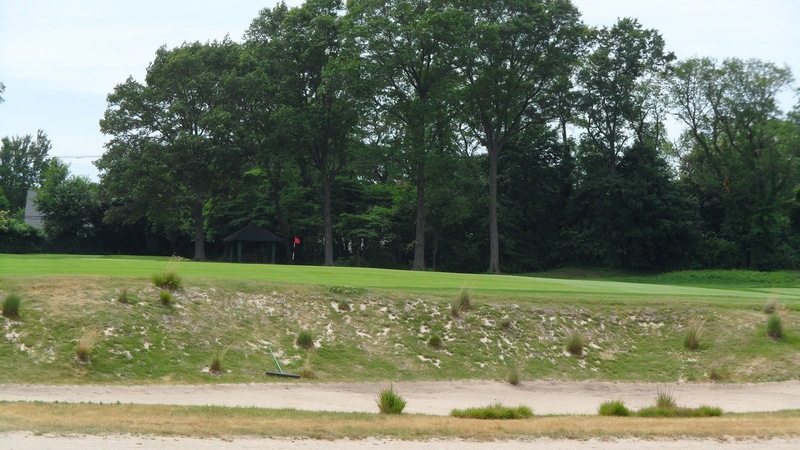 The photo below was taken just short of the bunker that crosses the fairway. 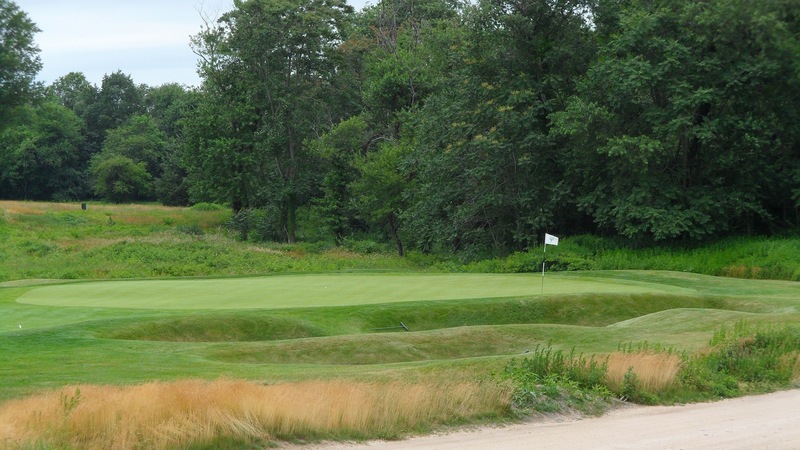 The 16th hole is one of only two holes at Garden City Golf Club with a water hazard. 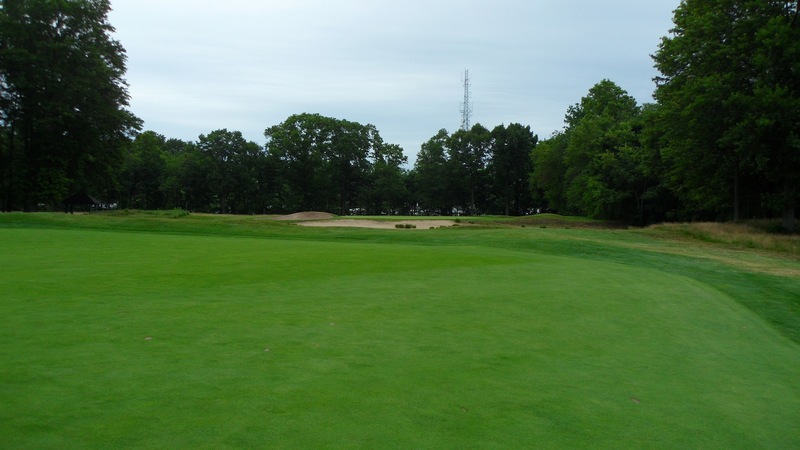 This par 4 plays at 405 yards and has a small pond on the left hand side of the green. I was running hot with a string of 5 pars so for my approach shot to this green I selected my “don’t go left “ 8 iron and ended up in the tall grass near the 17th tee. I chipped on but two putted for the bogey. The photo below was taken from the tee box. So I’ve played 16 holes and I’m currently six over. Four over on the front nine holes and so far two over on the back nine holes. For those of you who have been following my golf game you may recall that after dozens of close calls I have still yet to break 80. On a par 73 course I’m six over and I’ve got a par 5 and par 3 left to play . . . maybe this will finally be my day! The 17th hole is a short par 5 that plays 495 yards from the Championship tees. The photo below was taken from the tee box, but it doesn’t really show much. I was directed to hit my drive directly at the church steeple in order to have the best positioning for the hole. A short par 5 like this could be a good opportunity for a birdie. I put the peg in the ground, lined up and hit my ball directly out of bounds. So much for breaking 80 today! I re-teed and knocked my third shot out to the middle of the fairway. I couldn’t get there with my next shot so I laid up, pitched on, and two putted for a second ball par otherwise known as a double bogey. The photo of the green below was taken from the middle of the fairway and you can just barely see (click on the photo to enlarge) the bunkers on either side of the green. For those going for this green in two it is advisable to avoid these. Another unique quirk at Garden City Golf Club is that the course ends with a par 3 hole – and its no slouch. The 18th hole plays 190 yards and requires a fairly significant carry over water. There is a deep bunker on the front of the green and over to the left of the green is a bunker known as the Travis Bunker. 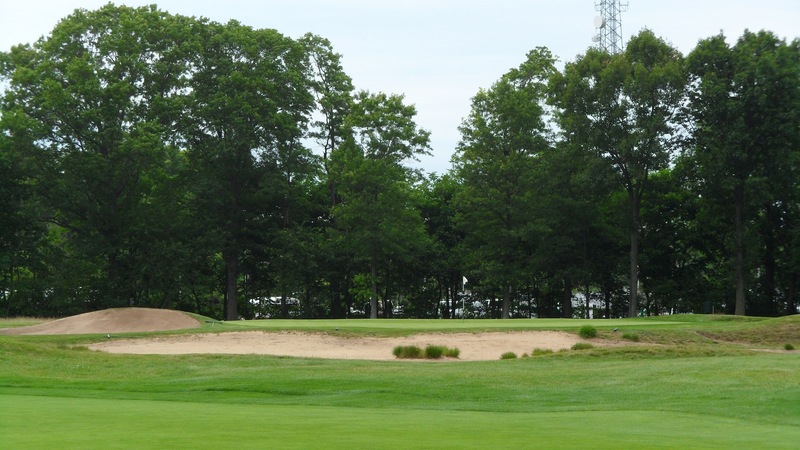 The Travis Bunker was built by The Old Man himself as a reactionary measure to being defeated by an opponent who hit his tee shot to that spot and managed to get up and down for victory. Travis did not like that . . . and who would . . . so he built the bunker there to decrease the likelihood of it happening again. Well, guess who hit their tee shot in the bunker the very next year during a tournament . . . that’s right, Walter Travis – hence the Travis Bunker. The photo of the 18th hole below is a little more zoomed in and shows the green a bit better, but does not show the Travis Bunker which would be just outside the left edge of the photo. To sum up, I had an absolutely wonderful day at Garden City Golf Club. The course is incredible and I absolutely loved it. 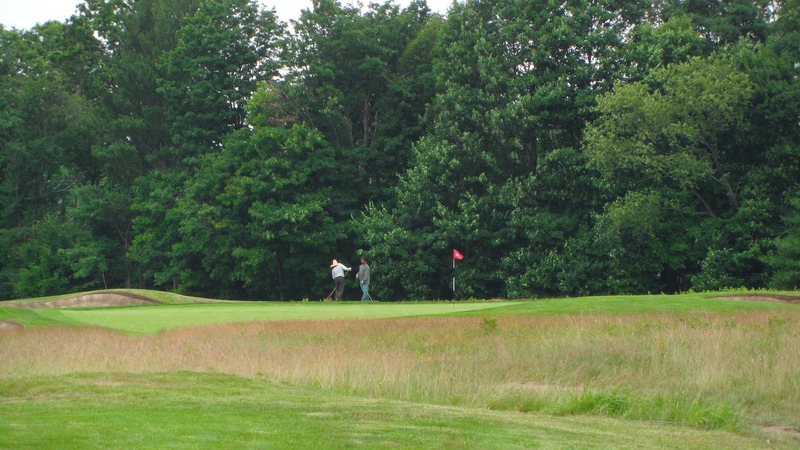 Although bad shots will be penalized, the course is very fair and playable for all skill levels. 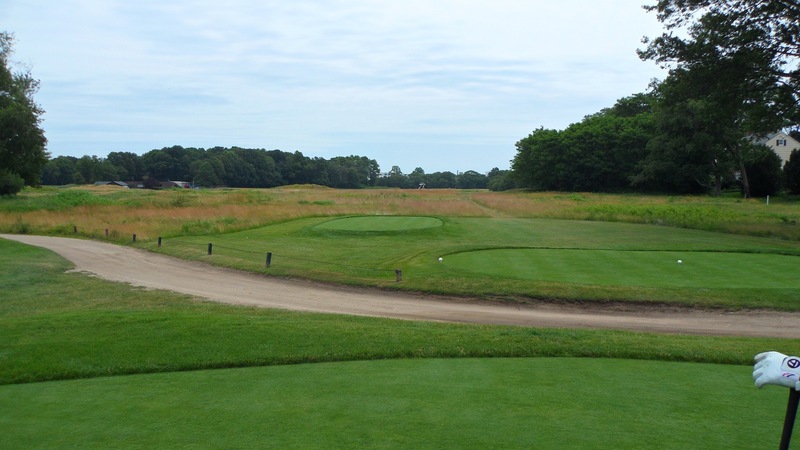 The natural and unforced way that the golf course lays out over the land surely served as inspiration for today’s minimalist golf course architects. I hear that Garden City Golf Club is one of Ben Crenshaw’s favorite spots. That doesn’t surprise me a bit. I’ve been lucky to play a great many golf courses but there are few I have experienced that can compete with the natural, unbleached feeling of Garden City Golf Club. After we finished up a quick lunch I zipped over to the airport to catch an earlier flight back to Richmond which delivered me home by 7PM. An exhausting day, but one that I would gladly do again any time. Thanks very much for the photo’d. What beautify course! I really enjoyed seeing the layout and I can just imagine all the classic events and history. This means a lot to me because my father played the course for many years back in the 30’s and 40’s. I know he represented the club and he won some events. 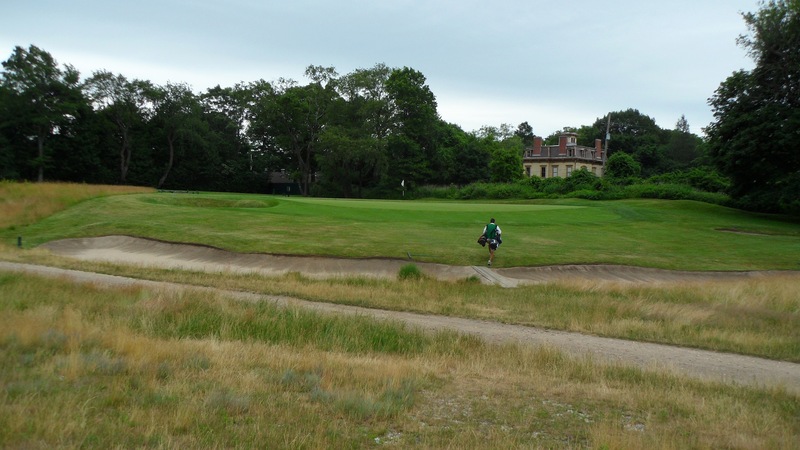 I never realized how great a course really is, nor the history behind it. Dad was pretty casual and didn’t talk about the club all that much. I had heard some stories when I was growing up, but I guess I took what he said for granted. I grew up on the west coast and this seemed like ancient history to me. Recently I was polishing a trophy from some event in 1941 and I decided to try to find out more on the history. I’m really impressed now. This brings me great meaning! Dad had said it was a top clubs and many US events had been held there. Mainly the US Amateur which at the time was one of the larger events. Love to play there some day. Thanks for sharing!